Home > Publications > Ukraine, another ‘Iraq moment’ for Europe? Ukraine, another ‘Iraq moment’ for Europe? This short commentary draws some parallels between the Ukrainian crisis today and the Iraqi intervention in 2003, notably with regard to internal European divisions and the need for a ‘strategic moment’. Are we back in 2003? In the current debates over Ukraine, some parallels emerge. In the run-up to the US intervention in Iraq, in 2003, Europe was deeply divided. The UK and Spain were leading a group of countries favourable to a more aggressive policy vis-à-vis Saddam Hussein’s regime, whereas other countries led by France and Germany wanted to give diplomacy another chance. The transatlantic relationship was shaken as well, not least because the American rhetoric was perceived as deepening the intra-European rift. Everyone remembers former US Defence Secretary Donald Rumsfeld’s divisive talk on ‘New Europe’ versus ‘Old Europe’. Today’s handling of the Ukrainian crisis bears some resemblance with the Iraqi scenario. Since the beginning of the crisis, European leaders have expressed diverging views on the possible policy options. They disagreed on the scope of sanctions then. Now they disagree on a possible transfer of arms to Ukrainian forces. This time again, just like in 2003, some ‘new’ Eastern European governments have more radical views than their ‘old’ Western European counterparts. Estonia, Lithuania and Poland support the ‘arming’ option to a greater degree than France, Germany or the UK. Some dissensions have also regularly surfaced between Europeans and Americans. However, the parallel with 2003 has its limits. The line of division within Europe is not the same as it was then, and it relates to more pragmatic interests. For instance, the division between London and Paris over sanctions results from their vested interests in the financial and defence sectors respectively. Furthermore, beyond their divisions, Europeans have managed to carve a common response to Russia – sometimes following intense debates – whether through their common sanctions policy or through the Franco-German leadership over diplomatic negotiations with Ukraine and Russia (Minsk II agreement). The transatlantic rift is also less profound than it was in 2003. The disagreement goes over a different tone or scope of response, not over a fundamentally different one. The rhetoric among transatlantic partners is in any case much less acerb. Another element could yet reinforce the parallel between today and 2003. In her speech at the Munich Security Conference, on 8 February, EU High Representative for Foreign Affairs and Security Policy, Federica Mogherini, announced her intention to launch ‘a process of strategic reflection to guide the EU’s foreign and security policy’, before adding: ‘we need a strategy’. In other words, she seems willing to re-open a debate about the EU’s foreign policy objectives and priorities. It is striking that the previous similar exercise at the EU level took place…in 2003. Then High Representative Javier Solana led the drafting of the first European Security Strategy (ESS). The purpose was highly political then. The EU wanted to re-assert both its unity and the importance of the transatlantic bond, in the aftermath of the Iraqi conflict. But it also had a strategic design. While European diplomacy and resources were heavily focussed on Iraq, the reflection offered a good opportunity to take a step back and think more comprehensively and strategically about the various challenges that Europe was facing. These days, European diplomacy is focussed on Ukraine. Yet, there are many other challenges that require European attention, not only at Europe’s doorstep but also much beyond. Ukraine is certainly one of the key issues of the day, but Europeans should also be ready for tomorrow’s challenges. Like in 2003, the strategic debate could seek to re-affirm European unity, which is challenged both externally and internally. Key partnerships must also be re-evaluated: the one with the US still needs reassurance, notably in the aftermath the Snowden leaks, whereas the partnership with Russia must clearly be redefined. 2015 is not 2003. Europeans disagree but they resolve their disagreements in the EU framework – before eventually reaching a compromise. 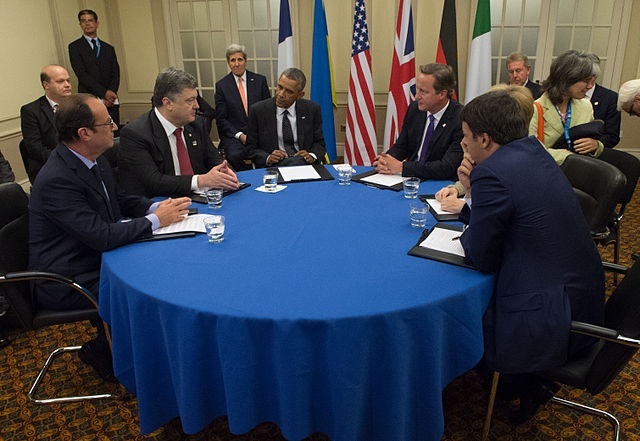 The rift with the US persists, but it is nothing new, nor specific to Ukraine. Twelve years after the drafting of the ESS, a new debate on the EU’s foreign policy objectives, priorities and partnerships would be most welcome. As in 2003, the EU should use the current crisis to create a ‘strategic moment’.